To contact the Webmaster, visit the ‘Contact Us’ page and complete the form with the information requested. When completed, click Send. 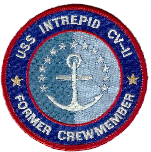 © Website created by FCM Neal O’Connor exclusively for the USS Intrepid Former Crew Members Association, Inc. and its members. the Galleries page on our website, follow the link below.